Steel Concrete Curing Tanks - Gilson Co.
*Curing Tanks are oversized and must ship via motor freight. Steel Concrete Curing Tanks are filled with lime-saturated water and maintained to proper temperatures. They meet all requirements specified in ASTM and AASHTO for initial field and long-term laboratory curing with less expense and greater adaptability than full-scale moist curing rooms. 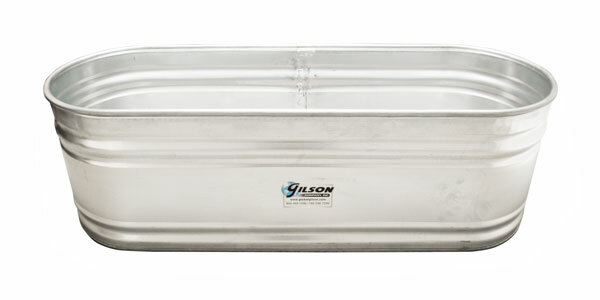 Gilson offers a range of 2ft (0.61m) deep tanks for curing cylinders, beams, and other molded specimens. Pipe-reinforced top provides extra-strong, crush-proof rim, and sturdy rolled seam with enclosed sealant prevents leaks. Side panels are 22-gauge, zinc-coated galvanized steel with both diagonal and horizontal corrugations for additional strength. Bottom is 20-gauge, zinc-coated galvanized steel. All four models come with a drain plug. *Curing Tanks are oversized and must be shipped via motor freight.